You are here: Home / Parenting / Happy single parent – can it be? Happy single parent – can it be? I recently won a copy from Single Mom Seeking of ‘Accidentally on Purpose: The True Tale of a Happy Single Mother‘ by Mary F Pols. 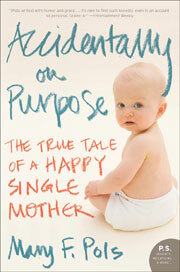 I liked the first part of the book title – ‘Accidentally on Purpose’ because I can kind of relate to it, but the second part ‘The True Tale of a Happy Single Mother’ really made me think. Am I, a single mother, happy? Can any single mother be happy? Most of the time I’m happy, or I think I am, and I wonder how other single parents feel? I know a few of them but I’ve never asked them directly if they’re happy or not. I also know that every single parent’s circumstances are quite different and if you’re escaping from an abusive relationship and are living in poverty then it’s unlikely that you’ll be that happy. I was curious to know what made Mary happy as a single mother. A bit of background: Mary became pregnant after a one night stand at age 39 and decided to keep the baby. She told the baby’s father and she was very lucky that he wanted to be involved. It wasn’t that simple of course, but generally it’s worked out pretty well for her. Unlike Mary’s situation, my son’s father is not involved with him. He lives in a different country and I’ve lost touch with him. You can read more about about meeting JJ’s father (on Ourstory.com), when I found out I was pregnant, and what it felt like to be pregant while single. During those early days when I was pregnant and a new mum I don’t think I was that happy. I was stressed. I really missed adult company – especially when I wasn’t working. Now I’m much more at ease being a single mum but I still look at my son in wonder sometimes because I can’t quite believe that he’s mine. It’s a weird feeling when I remember that I’m a mum and that I’m responsible for another human being’s wellbeing. So now I am more at ease with being a mum and with my situation I am pretty content. When I do feel a bit down I look at the good things in my life – my son and I are healthy, I’ve got a job, we’ve got a pretty good social life and a good network of friends and family, and I’m buying my own house with a manageable mortgage.A good state of mind is so important and quite vital in the happiness stakes. I could have it so much worse. So to you single mums, or single dads, are you happy? If you’re not a single parent I’m sure you know some. Are they happy? wow Jen – I am so privileged to share this story. It must be both hard and a blessing to be a single parent some days. I experienced it for only a few weeks. I an in awe of you and what a great job you are doing with Jj. You are both blessed to have each other. More money might make me happier but I made a choice to be a single parent. I also make the choice to only work part-time while my child is little. Sometimes I feel down, but that has nothing to do with being a single parent. I would be down regardless of my circumstances. Like you I look at the things we have, health, job, social life, good friends and family, and a manageable mortgage. Thank you Trish. We are blessed. M&B – glad to hear it. About working part-time – can you ever imagine yourself going back to full-time? I work 4 days a week and don’t know if I could cope working 5 days a week outside the house. I’d first want to ask someone to define happiness and then see whether I fit into being happy as the life-partner of someone with an addictive illness or as the parent of four children with an unsupportive partner. Both states I have experienced as well as a period as a single parent between between the second and the first and whilst there were periods when I was glum, stressed, angry or whatever overall I believe I was happy – and still am even though I still have that elephant in the living room. I cannot imagine full time but probably 4 days a week like you when Boo starts school. Thanks for the link love! Glad that Mary’s book got you to think. I’ve always considered that “Are you happy?” question to have so many angles? Most human beings (women, shall I say??) have great mood swings (well, I do! )… and at this point, happiness means being able to hold myself through the rough patches. Being a single parent DOES get easier as you get more practice — and your child gets older. Really. Single Mom Seeking – I am getting a lot better at holding myself together through the rougher patches – thank goodness. I try to really enjoy the good moments and try to get through the not so good moments.